Christmas Day is nearly upon us and anyone who hasn’t installed a stove in their home is missing out on a real festive treat. The fabulous warmth, nostalgic smell and delightful sight of flames dancing in a wood burning stove take the Christmas atmosphere to a whole new level. When you gather the family around a stove to enjoy the festivities, the stove becomes part of the celebration. Regardless of whether you choose a wood burning, multi fuel or pellet burning stove, Christmas really isn’t Christmas without one. Although it can be tempting to adorn an attractive stove area with stockings and other decorations, stay safe and keep combustible materials well away from the heat. However, there are lots of other ways in which your stove can get involved in the festive fun. As well as making any room deliciously cosy, stove tops are great for warming your mince pies, keeping the chill off your mulled wine or making sure the casserole stays hot while you enjoy a last-minute snowball fight. For another traditional seasonal treat, you can use them to roast chestnuts. In fact, don’t throw away those discarded shells – save them and use them the next day to help start your new fire. Chestnut shells are great as firelighters and the smell they give off is lovely. To add more festive fragrances to your stove, try foraging in the garden or undercover areas for other woody material you can add to the fire. As long as they’re completely dry, things like pine cones will get your blaze going well and add their own distinct aroma of the great outdoors. We’d like to wish all our customers a very Merry Christmas and a Happy New Year. We look forward to helping you make more warm memories in 2019. Contemporary style with a wood burning stove? Absolutely! 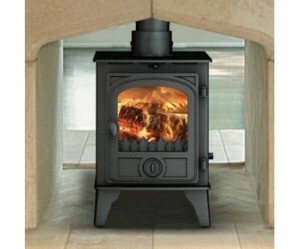 Here at www.stovesellers.com we aim to have the most up-to-date and correct information about all of our stoves online. However, technical and aesthetic features of the stoves we supply may change and without forewarning. We reserve the right to notify you of any such changes at the time of sale, and to change the content of this site accordingly at any time. ?